Whey protein is a widely used protein supplementation. They help you to make your body’s muscle protein synthesis better. Also, they also increase the growth of lean muscle mass when paired with proper exercise and diet. Whey is a protein separated from milk during the formation of cheese. It’s essentially a by-product. It is a complete protein because it has all the nine amino acids present. It has numerous health benefits. However, there are side effects as well if you do not use it well. We will now talk about the health benefits, side effects and dangers of whey protein in detail. We have reviewed best whey protein in India market. You should check out this post before buying a whey protein. Now let me talk about whey protein health benefits and side effects. Now, I would first talk about the whey protein types. There are three main types of whey protein. These are Whey Protein Isolate (WPI), Whey Protein Concentrate (WPC), and Whey Protein Hydrolysate (WPH). Whey Protein Isolate generally contains at least ninety percent protein. They are processed to get rid of all the lactose and fat. Furthermore, Whey Protein Concentrate is another whey protein type. They have low carbohydrate and fat levels. The concentration level is inversely proportional to the protein percentage in them. Higher end concentrates have about 90 percent protein, whereas lower-end concentrates contain about 30 percent protein in them. This whey protein type is processed via partial hydrolysis. This is a necessary process for the body in absorbing protein. As a result, the WPH is known as the ‘Predigested’ whey protein form. So, the protein does not need the same digestion level as the other two. Also, it is used in infant formulas as they are digested better and have lesser allergen potential. Also, for the same reason, the WPH is used in medical protein supplements as well. Before we carry on with the aforementioned points, here are some fun facts on whey protein that will increase your knowledge. Whey is made up of immunoglobulins, alpha-lactalbumin, beta-lactoglobulin, and bovine serum albumin. Some of the many benefits of whey include weight loss and controlling cholesterol level. If used excessively, whey protein can cause stomach aches and nausea. However, when used in adequate dosage, it does not harm your body. Whey protein has several health benefits. However, not all benefits have been strongly backed by evidence. We will now talk about some of them. As mentioned earlier, whey protein is a liquid that separates from milk while producing cheese. Whey protein is high-quality complete protein. It is because it has all the nine essential amino acids. Besides, the protein is easily digestible than other proteins. Among the three different whey protein types, WPC is the cheapest and dominating in the market. Whey protein widely used by bodybuilders, athletes, and any person who wants additional protein source in their diets. A popular way to lose weight is to consume more protein in your daily life. The protein helps you to lose fat, and in turn, weight in three ways. They boost your metabolism. As a result, your body burns more calories than before. Also, protein lessens your appetite. So, your calory intake is also decreased. Also, even when you lose weight, it helps you to grow muscle mass. As I have said in the aforementioned point, whey protein helps in muscle growth. In general, your muscle mass lessens as you age. As a result, your body store more fat, and it leads to many diseases. But there is a way to prevent this event. Whey protein, coupled with proper training and diet aids in growing the muscle mass. It can do so as whey protein is rich in leucine, a branched chain amino acid. It promotes muscle growth more than any other amino acids. Although, you need to keep in mind, that if your diet and training is not right, no amount of add-ons such as whey protein will able you ever. The journal Anticancer Research recently published a paper. In it, scientists have claimed to found that regular use of WHC in cancer treatment showed positive results. However, this is subject to more extensive research. The British Journal of Nutrition published a study, seventy overweight men and women for twelve weeks were subjected to whey protein and casein in two different groups. In this time, scientists measured their insulin and lipid levels among other things. After this period, the people who took whey protein supplements had lower cholesterol levels than the casein group. Hypertension or high blood pressure is a serious health issue. Whey protein can help you lower your blood pressure. It does with the help of lactokinins. Lactokinin is a component of whey protein that helps in reducing blood pressure in humans. In a recent study with eleven children, whey protein proved to be helpful in curing asthma. Scientists gave the children ten grams whey protein for a month. They gave it to them twice daily for a month. The whey protein improved their immune response to asthma. Impaired insulin function and high blood pressure result in type 2 diabetes. Insulin is a hormone responsible for stimulating the uptake of blood sugar. It also keeps the blood sugar within safe limits. Whey protein increases the insulin amount in your blood. Also, it also increases its sensitivity level. In this respect, whey protein is far superior to the other protein sources such as egg white and fish. In fact, it is similar to the antidiabetic drugs at this point. So, if you consume a whey protein supplement with a high-carb diet, it would keep your blood sugar under control and would fight type 2 diabetes. Furthermore, whey protein helps to reduce inflammation. Inflammation is essentially your body responding to damage. Although it is helpful to you, it can cause issues in certain circumstances. Chronic inflammation may be a symptom to bad lifestyle habits or unnoticed health hazards. It can be harmful and a serious risk factor for you. In a recent study, scientists saw whey protein reduces C-Reactive Protein (CPR) in your body which is the main marker for inflammation. Inflammatory bowel disease is the chronic inflammation of the digestive tract lining. It is a relative term for Crohn’s disease and ulcerative colitis as well. Scientists found that whey protein is useful in treating this condition in both rodents and humans. But keep in mind that further research is essential in this matter. Whey protein is rich in cysteine. Cysteine is an amino acid responsible for producing glutathione. Glutathione is the most important antioxidant in the human body. Antioxidants act against the body oxidation. As a result, it lessens oxidative stress. In turn, it helps to reduce aging and reduces the risk of several chronic diseases. So, consuming whey protein helps in achieving that effect. The fullness you get from eating a meal is satiety. Among the macronutrients, protein is by far the most satiating. Whey proteins, as you already know, is rich in protein. So, when you take whey protein supplements, it reduces your appetite. Whey protein is particularly unusual as it does not have a natural equivalent. If you take it in proper amount with your diet, it can work wonders for you. However, many believe that it is not an ideal product due to its high protein content. Although this is not true, it is not all wrong either. The accepted dosage of whey protein is 25-50 grams per day, that is, one to two scoops. But some people consume it excessively, thinking their muscle would grow faster. However, nothing could be farther from the truth. 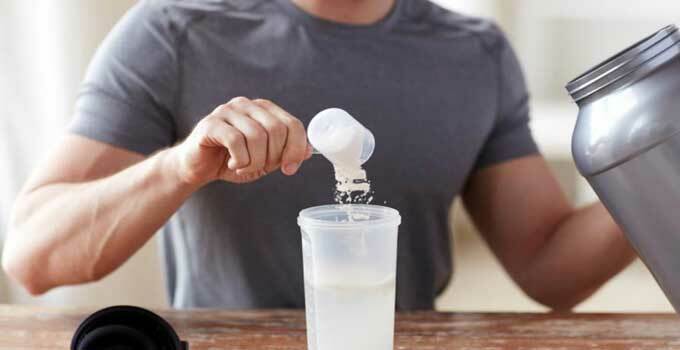 When taken in excessive amounts, whey protein can cause health issues. Some of these issues include stomach ache, bloating, nausea, headache, cramps, fatigue, diarrhea, and flatulence. Also, regular high dose intake of whey protein for long periods can result in acne. You need to realize that just taking more amounts of protein does not mean you would grow faster. Your body can not process that much at once. So, be cautious, take only the proper amount and give your body time to grow. These are the health benefits, side-effects and dangers of whey protein for you. If you think I have missed something, or there is something else you would like to see, please let me know in the comments section below. Also, ask anything you have in mind.